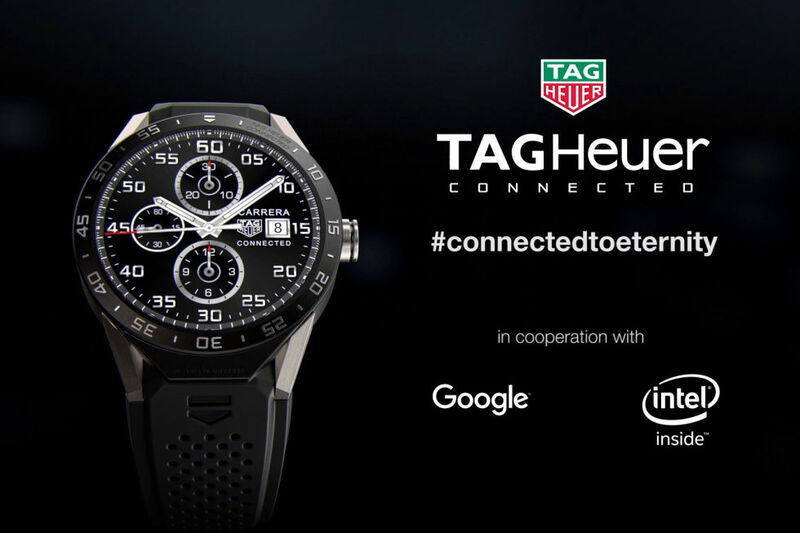 Tag Heuer joined in on the wearables party with its TAG Heuer Connected smartwatch, claiming the pole position for the first luxury smartwatch running on Android Wear. The Tag Heuer Connected smartwatch is built up on the Tag Heuer Carrera inspiration. At first glance, the watch is easily mistakable for a traditional timepiece. The chassis of the watch is made from Grade II Titanium, while a scratch-resistant sapphire crystal protects the 1.5″ circular 360×360 LCD display, giving a pixel density of around 240 ppi. For the straps, the Heuer Connected opts for vulcanized rubber straps with titanium folding clasps and safety push buttons. The straps are available in seven different colors, albeit only the black straps are available for online purchase with the rest being restricted to offline store stock. Overall, the watch looks and feels like other Tag Heuer and luxury watches that are available in the market. On the inside, you will find a 1.6GHz dual-core Intel Atom Z34XX processor, flanked by 1GB of RAM and 4GB of storage. The watch also supports WiFi 802.11n and Bluetooth 4.1, and comes in with a gyroscope, tilt detection sensor, microphone and a haptic engine to complete the suite of sensors on the device. The device does boast of a 410 mAh battery (massive for Wear standards), runs on Android Wear and is compatible with Android 4.3+ as well as iOS 8.2+. The price of the device is what makes it stand out. True to its word, the Tag Heuer Connected boasts of a price tag of $1,500. That is a lot of money to spend on a device that still suffers from obsolescence due to the natural progression of time and technology. However, to combat this, Tag Heuer is offering a 2 year warranty with the device, along with an offer to exchange the Connected at the end of two years for a special edition Analogue model. There is one catch, though: you will be expected to shell out another $1,500 and trade-in your Connected for this Analogue model. Luxury does come at a price, and the Tag Heuer works on this principle. While the soul of the device remains Android Wear, the exterior (and the brand) is what demands all of your money. The spec sheet of the device is quite unimpressive for its price, as it also skips on sensors like the heart rate sensor, which could have been added when price is a non-issue. At the end of the day, if you are a connoisseur of luxury watches, this could be a worthy addition to your collection as it still stands tall as the first Android Wear luxury smartwatch. This is a luxury watch first and foremost, which also happens to be running on Android Wear as a sidenote. What are your thoughts on the Tag Heuer Connected? Can Android Wear aim to completely capture the luxury smartwatch market before Apple can? Let us know your thoughts in the comments below!